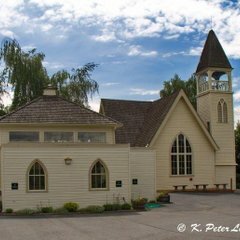 The Central Okanagan Heritage Society is a non-profit Society and a Registered Charity. The Society was incorporated in 1982 and operates with a volunteer Board of Directors, and several part-time and seasonal staff. The Society operates within the geographic boundaries of the Central Okanagan Regional District. 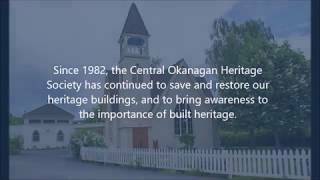 The Central Okanagan Heritage Society promotes conservation of the diverse heritage buildings and sites of the Central Okanagan through stewardship, education and collaboration for the benefit of current and future generations. Guided Tours of Benvoulin Church at 3pm, alternate Sundays May - September Join us for a public guided tour of the historic Benvoulin Heritage Church and grounds and discover the history and architecture of this heritage site.